The Iranian Center for Advanced Systems and Technologies (CAST) from University of Teheran has recently publically unveiled Surrena III, a very advanced adult-sized humanoid robot, who can walk, run, speak and recognize people. This is the third version of the robot, released 7, and respectively 5, years after its predecessors, Surena I and II. What Surena III can do? The very first version of the Iranian robot had only very limited capabilities, given the 8 degrees of freedom (DOF) of the joints. With Surena II, the researchers reached 22 DOF and a walking speed of 0.03 meters per second (m/s). The new prototype, Surena III, is almost 10 times faster, with a speed of 0.2 m/s and much improved movement skills given by its 31 DOF. During the unveiling demonstration, the humanoid robot, which is 1.9 meters (6 feet 3 inches) tall and weighs 98 kilograms (216 lbs), walked across the stage, imitated the gestures of a person and stood on one foot while bending backwards. The robot comes equipped with a spoken interaction interface (voice recognition and speech modules), which together with the Kinect-based 3D vision module and the 31 joints servomotors allow for recognition of persons and objects, imitation of human gestures and tracking of a persons’ motion. The popular Robot Operating System (ROS) has been preferred by the researchers for Surena III, which allows for simultaneous task handling (e.g. environment awareness, behavior management, self-monitoring, etc.). The sensors and actuators of the robot have been significantly improved compared to previous version. Surena III is able to walk up and down stairs and ramps, adapt to ground conditions (i.e. irregularities), and has grasping and kicking capabilities. Worldwide, the humanoid robot’s research and development has shown much more progress, as constantly demonstrated by the DARPA Robotics Challenge, which in 2015 was dedicated to a disaster-response simulation sponsored by the Defense Department of the United States of America. Up to now, one of the most advanced humanoid robots was ASIMO, developed by Honda’s engineers a few years ago. It can reach a walking speed of 1.7 m/s, running speed of 4.3 m/s and his joints have a total of 57 DOF. ASIMO’s next version, which is specifically designed for disasters, is also capable of climbing a vertical ladder. 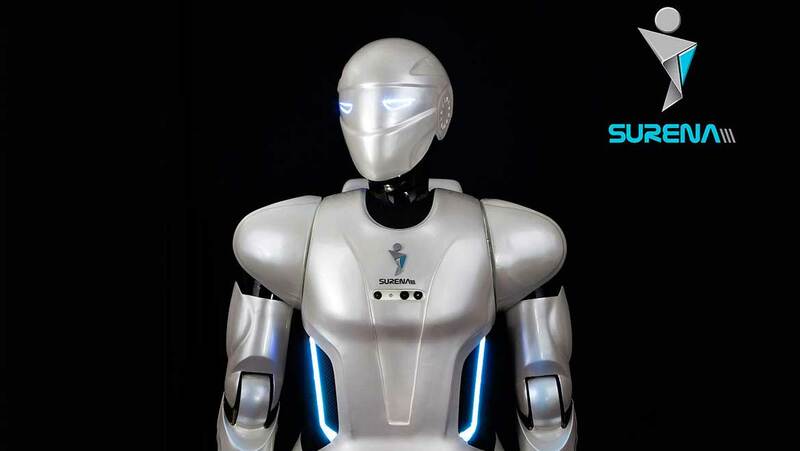 When compared to some of the robots that participated in the DARPA Robotics Challenge or to ASIMO, Surena III doesn’t show a very innovative character and seems to have rather limited capabilities, but it is still an advanced humanoid robot. The development team of approximately 70 students, engineers and professors, who helped during the development process of Surena III, will next focus on the robot’s autonomy and interactive features. Following the statement of Professor Yousefi-Koma from CAST, who characterized Surena III as a symbol for technological progress “in the direction of peace and humanity”, we are looking forward to seeing Surena III and the next generations at work.